Experience one of the World's finest cave systems by seeing 2 caves in one day. See spectacular limestone formations. You will have guided tours of both the Chifley and Lucas Caves. There will be a short time for lunch where you may purchase at the Caves or bring your own lunch. 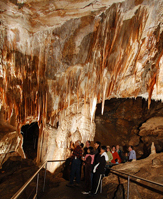 Tour includes return coach travel, informative commentary and guided tours of the Chifley and Lucas Cave. This tour departs the Caves at 3.30pm to return to Katoomba at approximately 5.00pm. Please meet at the Bus Stop at the Carrington Hotel, 15-47 Katoomba Street, Katoomba NSW 2780, 15 minutes prior to departure time of the tour. Please wear enclosed shoes for cave tours. This service may operate as a co-share and is also subject to minimum numbers travelling for departure.